About this time last December my wife and I left the cold temperatures and hazy skies of northern Utah and headed south to the warmer temps and clear skies of St George, a lovely little desert community surrounded by beautiful red rock country in the southwest corner of the state. St George is situated near diverse birding locations and is the home of the annual St George Winter Bird Festival held each January. In the right seasons the desert, forest, and riparian habitats offer some great opportunities for northern Utahns and other visitors to see bird species such as Greater Roadrunner, White-winged and Inca Dove, Verdin, Phainopepla, Lesser Nighthawk, Gambel's Quail, Vermilion Flycatcher, Anna's Hummingbird, Black-throated Sparrows, migrating waterfowl, and many more. One of my favorite spots to visit in St George when I need a quick birding fix is Tonaquint Park and Nature Center. The park is located right in town and provides great bird habitat because of its gardens, trees, and proximity to the Santa Clara River, which runs between the park and a golf course with waterfowl-attracting ponds. I made a few early morning visits to Tonaquint Park during our stay in St George last December and was delighted to see lots of fun little birds and a few accipiters looking for breakfast each morning I visited. One morning I was trying to position myself between some bushes to get some images of Gambel's Quail. With almost no warning I found myself spinning away from a close encounter with a fast moving bird that seemed to be flying directly toward my head as it rounded a bush ahead of me. I did an instant replay in my mind that went something like, "dark gray on top, orangish belly, white around the vent area. Was that a Robin? Of course not. That bird was way too fast and acrobatic. I bet it was an accipiter. Maybe a Sharpie." I turned and followed the path and discovered an adult Sharp-shinned Hawk, our smallest North American hawk. I watched it attempt to nail several passerines in the area and was amazed at what appeared to be near 90-degree turns mid-air. It perched for a moment and I crept up behind it to capture a few images revealing the front and back of the bird. In the images below you can see its dark nape (as opposed to pale nape of Cooper's hawk), squared rather than rounded tail formed by equally long outer tail feathers, the narrow as opposed to prominent white tip on the tail feathers, its high-centered barrel chest, and relatively small head in comparison to its body. Just a month before my moment with the adult Sharpie in St George I had a special moment with a juvenile as I pulled into the parking lot near my place of work in South Jordan, Utah. It was a cold November morning. I arrived at work a few minutes early so I decided to pull into a parking space that faced a farm field bordered by a stream and Russian Olive Trees to check for bird activity. The rays from the sun were starting to hit the field. The warmth of the rays gradually melted the frost as the shadows retreated from the field. I looked up from inside my truck and saw a Magpie flying a few feet above what turned out to be a juvenile Sharpie. Both were moving in my direction and practically right in front of me. The Magpie dove at and made contact several times with the Sharpie's back as it chased it away from the area. Both birds disappeared from my view as they flew behind some trees. The Magpie reappeared at the top of one of the trees and seemed to be in an attitude of scolding. I figured it might be a clue to the Sharpie's new perch so I went into stealth mode with my camera and moved quietly along the tree line. I soon discovered the perch of the Sharpie and witnessed a moment in time I will never forget. 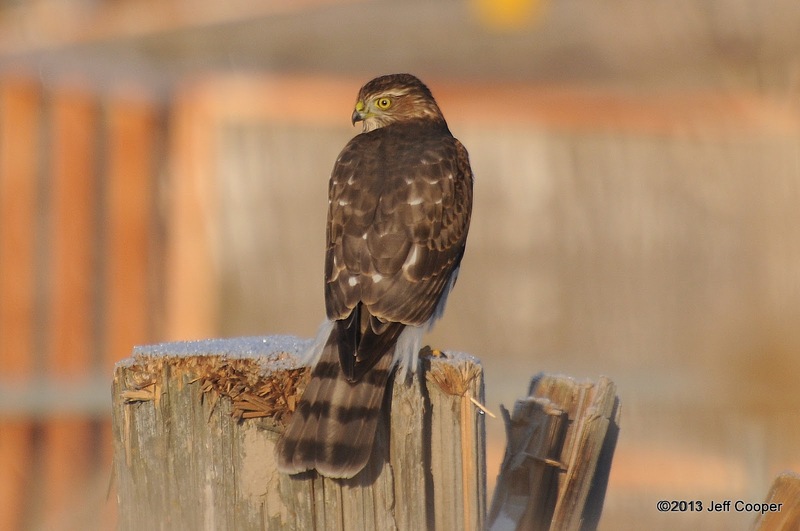 The young hawk was perched on a post that was just beginning to receive sunlight so the frost on the post was beginning to sparkle. I knew that within moments both the beautiful crystals and the young bird would be gone. The timing for witnessing two beautiful creations of nature in one fleeting moment was fortuitous and impressive. And for that I was grateful! Stunning photographs and wonderful narrative! Those Sharp-shinned Hawks are really quite a sight.